Another gift that I got from my birthday yesterday was a dartboard in a case. I’ve always enjoyed sports/games of accuracy and anything that you can play while holding a beer is a game for me! As frustrating as it was to get the case mounted on the wall it was well worth the effort. The nice thing about darts is it takes a lot of concentration which means there is no room for distracting toughts like work. So it is a pretty good stress reliever. It is also a very social game allowing a number of people to play with plenty of time for conversation. 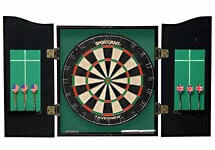 The case came with two sets of darts with British and Canadian flag flights and has the game Cricket setup on the white boards. For those of you who are not dart players Cricket is by far the most entertaining games for a casual darts player. The object of the game is essentially to get hit each of the following targets 3 times before your opponent: 20, 19, 28, 17, 16, 15, Bull. Another couple of notes the Bullseye should be 5ft 8inches from the ground, which is surprisingly high, and the players should throw 7ft 9inches from the board. If you haven’t played in a while dust off the old dart board and throw a few darts you’ll be surprised how much fun it is. If you don’t have a dart board head down to your local pub. Many pubs have dartboards and let you play for free. Enjoy. « Otter Tail Paddle for My Birthday!